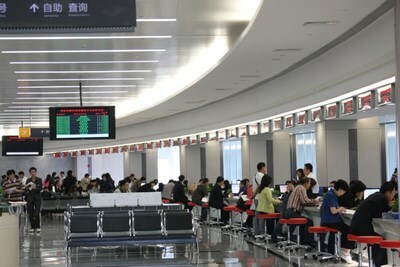 XI'AN, China, April 10, 2019 /PRNewswire/ -- The city of Xi'an in China's Shaanxi province has launched a one-stop civil service program. Online and offline, the program will enable the sharing of databases across departments and allow residents and companies to avoid repeatedly submitting documents, reducing document requirements by 60%. The program aims to deliver time- and cost-saving services by boosting the data and information flow, lowering communication barriers and eliminating information isolation across government sectors. By integrating government functions and services, more than 70% of city services can be ordered and processed through a single office, eliminating the need for citizens to submit documents to different departments. "We've launched this program to tackle the problems of slow response times and inefficiencies of city service delivery," said Bo Wei, Deputy Director of Big Data Source and Management Bureau of Xi'an. "By solving internal workflow issues, we can create a one-stop civil service experience, which will be a model of smart administrative process and a crucial element of Xi'an's larger smart city project." Xi'an has established a central hub for data storage, exchange, sharing and use, creating a fast and efficient system for data sharing, document verification and service pre-ordering and processing. A one-stop city services app was released in March as a hub for more than 500 of the city's most popular services. In addition, self-service machines and mail boxes will be deployed in crowded areas, enabling 24-hour document reception as well as service ordering and delivering. The app will connect to a national and provincial administrative service platform by the end of the year to form a one-government network between cities and surrounding communities. To bring more convenience to citizens, the program will apply a 15-minute service delivery standard at community centers and local administrative offices. 50% of services can be ordered through community centers this year, with the amount set to increase to 70% by 2020. For people who need intermediary services, the Xi'an government will also introduce an online "intermediary service supermarket" on its administrative service network, further lowering regional boundaries to avoid monopoly issues in the industry. The approach is expected to create open, fair and just market competition with an agreed standard. The capital of China's western Shaanxi province, Xi'an is an international tourist destination with its over 3,000 years of history and world-renowned attractions such as the Terracotta Warriors and Horses and its ancient City Wall. The city, dubbed "China's Outdoor Museum," was the starting point of the Silk Road, an ancient network of trade routes established during China's Han Dynasty that linked East and West through commerce. Xi'an now marches further to smart city construction to build the international metropolis.